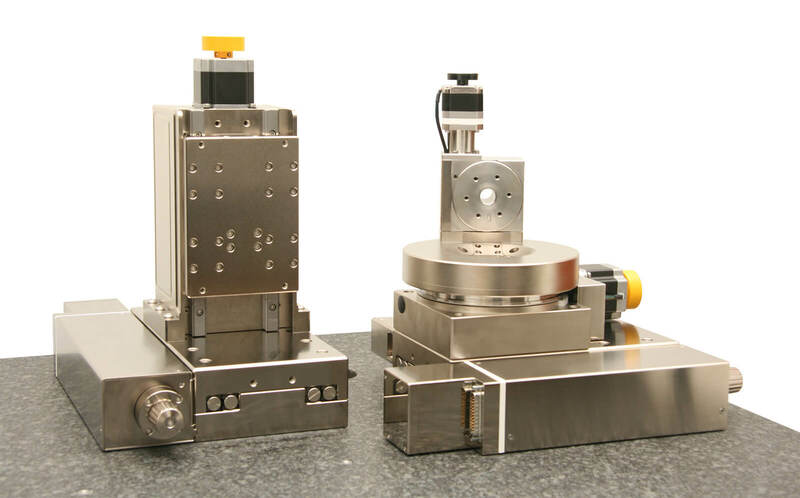 OEM Motion Solutions | 5 Axis Metrology Platform | Reliant Systems, Inc. 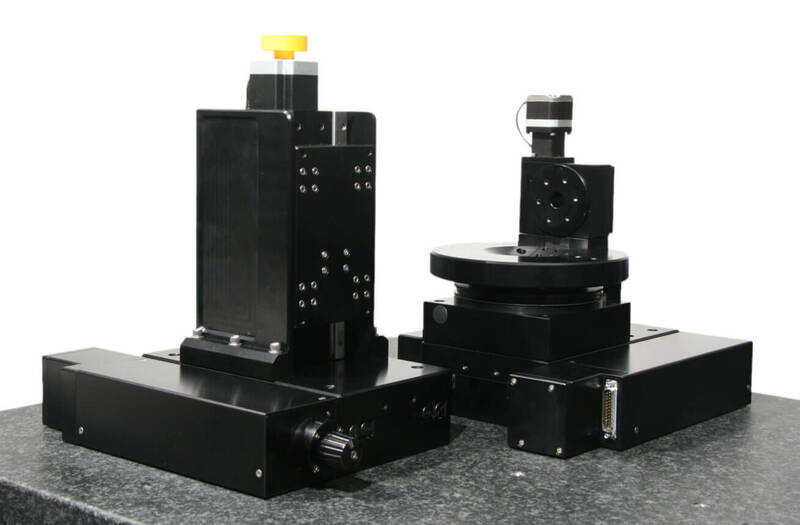 This motion platform consists of three linear and two rotary stages. 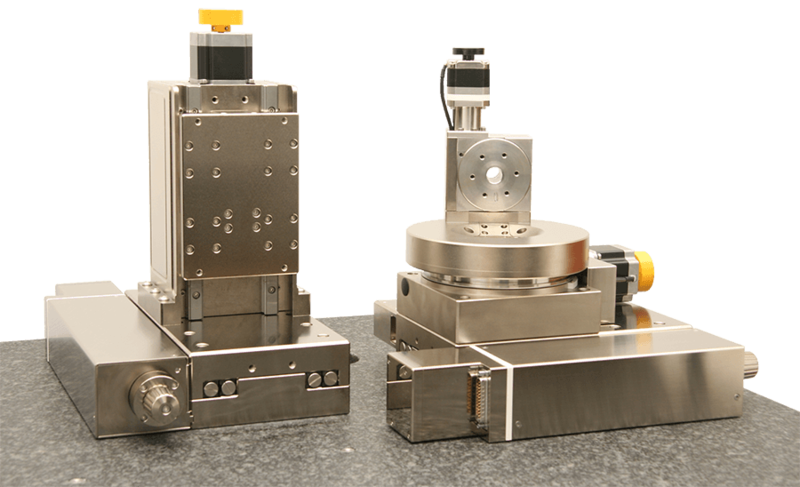 All 5 axes feature direct mounted position encoders to achieve a 3-Sigma bidirectional repeatability of better than ±0.3μm for the linear axes, and ±2 arc-sec for the rotary axes. X-Y-Z travel is 4 x 4 x 2 inches, Theta is 270°, and Phi is 360°. The X and Y stages are based on our CS crossed roller bearing series, with extra-long bearing cages used to keep angular errors to a minimum. Z is a mini Z-column, eliminating the need for an angle bracket and reducing the cantilever of the sensor head. Theta and Phi are direct encoded versions of the PR worm gear driven rotary stages with a resolution of 0.0001°. 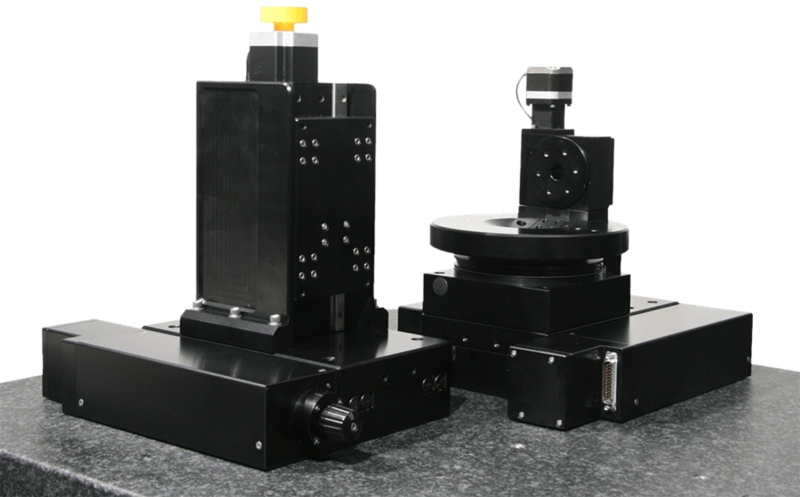 Due to the sensitivity of the measurement technique, motor power is turned off between moves making the ability of the worm drives to hold position a desirable feature. Since the travel of Theta is limited to 270°, all supporting cables for Phi are able to be routed through the center aperture of Theta. In place of the standard anodized aluminum, a nickel coating can be used to make the assembly safe for ESD sensitive microelectronic components. All five axes are mounted and aligned to one another on a customer specified granite surface plate. The full assembly is placed on a vibration isolation frame and shipped to the customer in a reusable crate designed to accommodate the completed system.